One day, I was remembering how I had a good time watching Valhalla Rising, an "artsy" movie, though hated by critics and not popular among the average Joes. It was very interesting, though the plot was a little dense, but for good reason - it had a mute protagonist, no narration, and little to no expository dialogue. Hell, if all artsy movies are that great, why shouldn't I look for the best of them all? 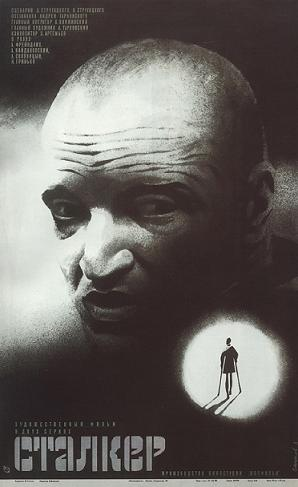 A relatively common, but intriguing, result was a 1979 Russian movie called Stalker. The movie was vaguely based on a Russian short sci-fi story named Roadside Picnic, written in 1971, which I plan to get more into later when I will make some comparisons between it and the movie. Still, the plot objects are the same between both versions: a small Russian town, a visit by otherworldly entities, the Zone, and an artifact capable of granting anyone's wishes. In the movie, sometime in the past, aliens visited Earth, staying no more than a few moments before leaving. The area in which they stood has become an extremely hazardous place called the Zone. Possibly radioactive and allegedly having an will of its own, controlling everything in the area, alive or not, this dangerous place harbors a great treasure: the Room, a place capable of making one's deepest, most secret wish come true. Our protagonist Stalker (probably his surname, very Russian), a man who knows the Zone entirely and all its secrets, makes a job out of his knowledge, cashing in from rich costumers by guiding them into the Zone (due to its nature, the government made a heavily patrolled cordon around while they, supposedly, study it) and to the Room. Facing financial difficulties due to failing to have a normal job for too long, our protagonist takes to the Zone a science professor and a decadent artist, who are the most prevalent secondary characters. The movie itself is indeed very well made on the technical aspect. The shots are just amazing, the photography and sudden changes (from sepia to fully colored) when moving between the city and the Zone really adds a mystique to it, and the acting of all present characters is really good. I would even say the extremely philosophical (and dense) dialogues (between characters or character to audience, as it happens sometimes during the movie) can be somewhat intriguing. But in my humble opinion, it failed to have substance, and it might have been intentionally so. The Stalker is very methodical in the way he travels the Zone, constantly throwing bolts as he is traveling trough a mine field, and insists to have the professor and the artist always following him closely, but even when they end up proceeding recklessly or get separated, nothing visibly dangerous happens. At most, the artist has a hallucination and passes out at some point. What mostly happens is objects that shouldn't be there appear, sometimes to a character's convenience, like a working phone inside the abandoned building right before the Room for the scientist to call his project chief and rub it in his face that he actually managed to get in there. But never does it transmit a real sense of danger, unlike in the book, in which the Zone anomalies are very visible, and sometimes even palpable, as we see the effects they can have on someone. The Stalker, at the doors of the Room, vehemently assures his clients it was indeed a miracle they managed to have such an uneventful journey with no casualties, facing (literally) violent skepticism. We, the audience, must take his word for it, which is part of the movie metaplot. Apparently, the director made many movies whose theme was faith, believing in someone or something, and the critics say Stalker was the conclusion of his artistic circle. So when Stalker, at the end, laments to his wife on how they don't believe in him, he might be talking not just about his clients, but also about the audience. The lack of unusual, supernatural elements on a sci-fi movie based on a sci-fi work that's full of them might have been intentional. It wasn't a movie about a book, but a movie about disbelief, incredulity, and faith. It is a impressive movie, that is undeniable, but it is very dense. Given the metaplot, maybe if you watched the director's previous movies (something I didn't do when I watched Stalker, and don't plan to do in the near future), you might have an easier time watching it. I, however, had to force myself through it. But it is adored by many critics, with some considering it to be the best movie ever, because unlike the average movie you go to see in theaters, it is art. But should artistic movies be judged differently from "normal" movies? Aren't all movies art? Art is not always entertainment, but entertainment is art as well. I came to this movie looking for entertainment, and failed to find it. Maybe you will have a different experience. I am no critic, no intellectual, no artist; it is entirely possible I merely didn't get it. 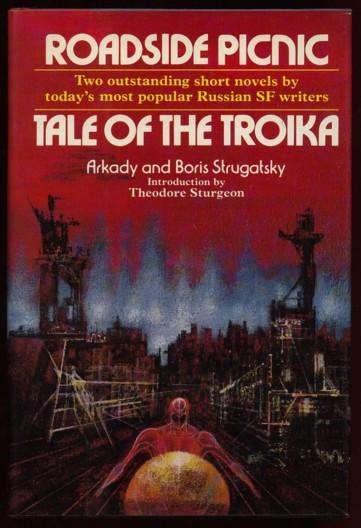 But one thing is for sure: I would pick and recommend Roadside Picnic over Stalker any day.